<<< These little bad-boys are the highlight of my year, and one of the few things in the last 12 months that (hopefully) won't end up in disaster! You probably can't tell but I'm furiously "touching wood" right now... (did anyone ever clock how wrong that expression sounds??) So yeah, I'm happy. Rob's happy. Will's probably not happy but seriously, we do have your ticket it just didnt get scanned into this picture!! 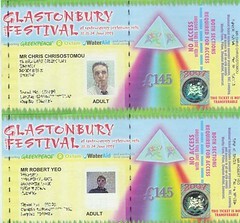 Michael Eavis is very, very happy (check out the price on the front of the ticket – scandal!!). And once again, just to ram home the point, I’m happy!! The “Adult” label under the photo is stretching it slightly don’t you think?